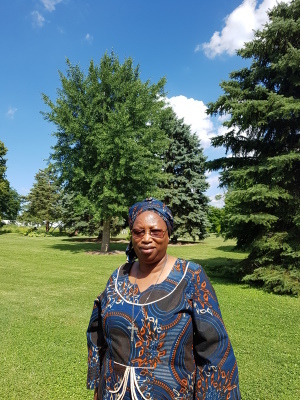 Our Foundress - Sr. Florence Muia, ASN, Ph.D.
Sr. Florence is the Founder and Executive Directress of Upendo Village in Kenya and provides hands-on HIV/AIDS services as well as coordinates the efforts of the Upendo Village staff and volunteers. She is a member of the Assumption Sisters of Nairobi, and currently Assistant Superior General. She was a Nobel Peace Prize Nominee in 2005 as part of the 1000 Peace Women project. This is the year of the Jubilee of Mercy . . . God is merciful . . We were here in 2014 but for the benefit of those who may not remember, I am Sr. Florence Muia, a member of the ASN an African religious community founded in the Archdiocese of Nairobi, Kenya in 1953. Our apostolates include pastoral work, nursing, teaching, social work, secretarial, agriculture among others. Am here to thank you in a very special way for your generosity and continued support for Upendo Village, a home based care project that supports people infected and affected by HIV and AIDS, in Naivasha Kenya. Upendo is a Kiswahili word for love. It is the love of God and his people that makes me to travel over 8,000 miles from Kenya to this church. This project was started by the ASN in partnership with the Wheaton Franciscan Sisters in 2002. The project started so small with at least 5 people needing care and support. To date we are reaching out to more than 10,000 people. Thanks for your generosity. These are people infected with AIDS Virus, both adults and children, grandmothers caring for orphaned children whose parents have died of AIDS. Love is a gift that only makes sense only when it is shared and experienced by the other. Today AIDS is the leprosy of our time. The sick need someone to show them love, care and give them hope. The dying need to die with dignity. In 2009 the late Bishop Joseph Imesch led a mission team to UV and saw first hand the suffering and poverty there and his life was never the same again! He told me Sr. Florence, "I have never seen so much poverty!" My dear family of God, am here to ask, am here to knock at your doors, once again, to appeal for your financial support so that we can continue to provide the much needed care and support to orphaned children, grandmothers, and people sick with AIDS & starving for food as well as spiritual and emotional support.You can help change a life of a child, wipe her tears and endow her with love & hope. Help bring a ray of hope to a grandmother whose heart is broken, burdened with care of orphaned children, languishing in poverty. Shalom is a young boy age 16 yrs now. He is HIV+ and on ARV medication. He was infected as a child and in 2013 his mother abandoned him under the care of Shalom's aging grandmother. Shalom's aunt came to his rescue and took him in her house and started to care for him. In 2014 she learnt about Upendo Village and visited us. Although aged 14 yrs at the time the boy looked like a 5yr old, severely malnourished weighing only 17 Kgs (37 lbs)! He was enrolled in our programs and put on milk and unimix flour program to supplement his diet. Within a year his weight rose from 37lbs to 64lbs and currently he weighs 72lbs! In 2015 Shalom came to my office and told me he needed a dairy goat so that he can be getting milk from it. I asked him if he would care for it and he quickly responded yes, sister. I promised to get him one and his face glowed with joy. He now has a goat and is able to drink milk from it. Your past donations is what has made it possible for him & other orphans to survive, mothers & fathers to move on despite the effects of living with AIDS! Many of these people live in deplorable conditions because of poverty. I plead for your generous donations to help us to continue feeding, supporting and caring for the suffering. God's love is unconditional, remember Jesus has no feet, no hands, no face today but yours and mine to bring hope and healing to the world. Kindly consider Upendo Village as a needy neighbor and donate as generous as you can, please cut us a big cheque and we will gladly cash it to help the poor. During the second collections, let us fill the baskets with money! They are very small! And for those who forgot their cheque books at home, please curry an envelop and mail the cheque to us.There are also display boards with more information on Upendo village & the programs. Kindly spare a moment and stop there, pick a brochure for more information. May your hearts be filled with love to cut a big check & change a life! We will be available for any questions or clarification at the end of Mass.